Visual Business Intelligence – Are You an Original? Do You Want to Be? 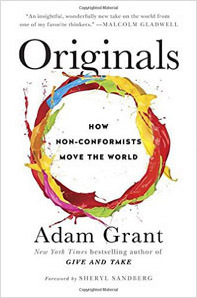 Adam Grant of the Wharton School of Business has written a marvelous new book titled Originals: How Non-Conformists Move the World. Similar to Malcolm Gladwell’s book Outliers, Grant’s book shows that originality is not something we’re born with but something that we can learn. We heap high praise on original thinkers who manage to make their mark on the world, yet our default response is to discourage original thinking. Being a non-conformist takes courage. Without useful originality, there is no progress. How do we foster greater originality in our world and in ourselves? Grant does a wonderful job of telling us how. Allow me to whet your appetite for this book by sharing a few excepts that spoke to me. They [originals] feel the same fear, the same doubt, as the rest of us. What sets them apart is that they take action anyway. They know in their hearts that failing would yield less regret than failing to try. Broad and deep experience is critical for creativity. In a recent study comparing every Nobel Prize-winning scientist from 1901 to 2005 with typical scientists of the same era, both groups attained deep expertise in their respective field of study. But the Nobel Prize winners were dramatically more likely to be involved in the arts than less accomplished scientists. Procrastination may be the enemy of productivity, but it can be a resource for creativity. Long before the modern obsession with efficiency precipitated by the Industrial Revolution and the Protestant work ethic, civilizations recognized the benefits of procrastination. In ancient Egypt, there were two different verbs for procrastination: one denoted laziness; the other meant waiting for the right time. “Shapers” are independent thinkers, curious, non-conforming, and rebellious. They practice brutal, nonhierarchical honesty. And they act in the face of risk, because their fear of not succeeding exceeds their fear of failing. The easiest way to encourage non-conformity is to introduce a single dissenter…Merely knowing that you’re not the only resister makes it substantially easier to reject the crowd. If you want people to take risks, you need first to show what’s wrong with the present. To drive people out of their comfort zones, you have to cultivate dissatisfaction, frustration, or anger at the current state of affairs, making it a guaranteed loss. To channel anger productively, instead of venting about the harm a perpetrator has done, we need to reflect on the victims who have suffered from it…Focusing on the victim activates what psychologists call empathetic anger—the desire to right wrongs done to another. I hope that this brief glimpse into Originals is enough to convince you of its worth. We need more originals to solve the many, often complex problems that threaten us today. This book doesn’t just make this case, it outlines a plan for making it happen.